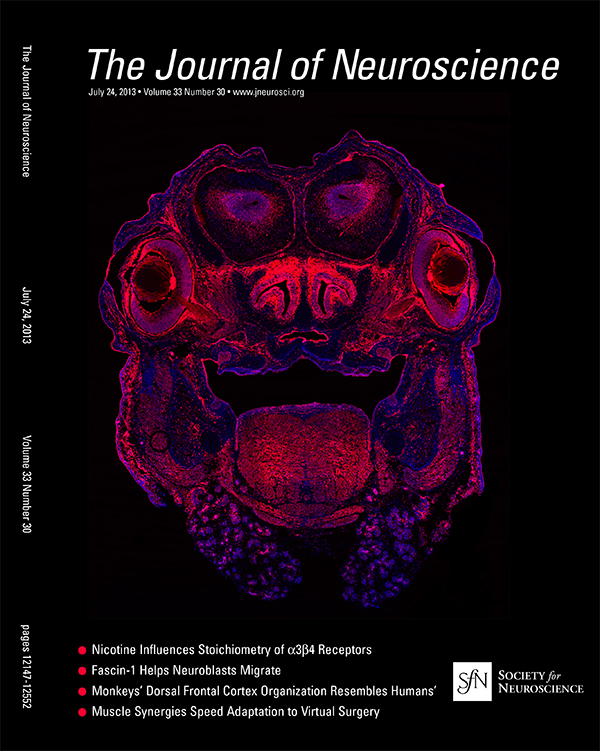 The Levine lab here at the Moran Eye Center has a new publication out in the Journal of Neuroscience and even scored the cover. Specifically, the manuscript was authored by Patrick J. Gordon, Sanghee Yun, Anna M. Clark, Edwin S. Monuki, L. Charles Murtaugh, and Edward M. Levine. The Levine team explored how multipotent retinal progenitor cells (RPCs) control the ordered production of the major cell types in the mouse retina. The key finding in this manuscript is that the Lim/Homeodomain protein, Lhx2, is a progenitor-intrinsic regulator of maintenance/self-renewal, precursor production, and competence progression. They arrived at this conclusion by generating Lhx2 conditional knockout mice at multiple stages of development using an inducible Cre-driver (Hes1CreERT2) that specifically targets progenitor cells. This approach allowed them to perform day-by-day inactivations, achieving a temporal scale of gene expression control not previously reported in the retina. This is an important advance because the properties of RPCs are constantly changing, and we are now able to directly test the regulation of these properties in an appropriate temporal manner. As such, The Levine team has identified Lhx2 as an RPC-intrinsic factor that regulates maintenance, precursor fate, and competence simultaneously. The animated image above is a sequence of abstracted neuronal images from brain visual cortex that I originally posted here. The images are from neurons labeled with different probes, though that is not important for the discussion here. What is relevant is that I’ve been wondering why science does not more widely implement animated GIFS to explain and represent scientific image data for ease of communication. The .gif format is one of the oldest standards on the Internet for display of raster graphics, introduced by Compuserve back in 1987. In addition to their long history on the Internet, .gif files have wide support and are incredibly portable. (The history of the gif is summarized nicely here on a PBS Off Book video on Youtube). Animated gifs have made a resurgence of sorts on the Internet as a means to communicate or show motion in ways that were not originally intended, but nevertheless are innovative and useful. It would seem that for scientists and those interested in communication of scientific ideas, supplemental data are an ideal way to show animation or motion or any number of approaches useful to scientific communication. Granted, one can do all sorts of animations with video formats like MPEG or Flash (not very convenient for portable uses like phones or tablets) and new HTML5 and emerging HTML standards, but the gif is a robust standard that has been around for many years and can be utilized by those in parts of the world where bandwidth and some of the latest tools are not as available as they are in 1st world countries. As science and science education becomes more available via open access to wider audiences around the globe, we should strive to adopt open standards with low to reasonable standards for accessibility and gifs fit nicely within those requirements. The pigments in retinal photoreceptor cells absorb varying wavelengths of light, but the central chromophore, the molecule that actually absorbs the photon is identical. Its ability to tune the responsiveness comes from the association with other opsins giving an organism the ability to respond from the near ultraviolet all the way to far red. Interestingly, an article in Science by Wenjing Wang, Zahra Nossoni, Tetyana Berbasova, Camille T. Watson, Ipek Yapici, Kin Sing Stephen Lee, Chrysoula Vasileiou, James H. Geiger and Babak Borhan back in December demonstrates that you can generate “designer pigments” with a variety of applications through spectral tuning of the chromophore. They way they went about this work was mutating human cellular retinol binding protein II (hCRPBII), a protein normally found in the gut that carries retinol. Retinol (with an “o”) is very similar to retinal (with an “a”), but hCRPBII does not carry retinal. So, they mutated hCRPBII so that it would bind and carry retinal (with an “a”). At this point, the research group could start altering amino acids in the site that bound retinal to change the electrostatic charge for retinal and in doing so, created a set of pigments that absorbed pigments at differing wavelengths. The really interesting thing is that there was no resulting substantial conformational change in retinal. Rather, what changes is the distribution of charge that alters the responsiveness to wavelength which is kind of surprising, to me at least. Its a pretty cool study and worth reading that may show the way to fabricating pigments with a variety of applications from transgenic work in optogenetics to labeling of specific cell classes to potential computational applications. Image from: Tuning the electronic absorption of protein-embedded all-trans-retinal. Science. 2012 Dec 7;338(6112):1340-3. doi: 10.1126/science.1226135.